Jane Jacobs Would Be Pleased! 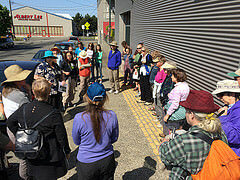 Participants on a Jane’s Walk discuss new development happening in Ballard. 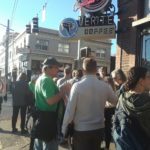 Were you one of the 149 people who joined one of the 15 Jane’s Walks around the Puget Sound region organized by Feet First? If you did, then you might have explored public gardens, public art, architecture, or learned about upcoming changes in a neighborhood. For the last three year’s we have been proud to be the host organization for Jane’s Walk, an international event celebrating the legacy of urbanist Jane Jacobs. 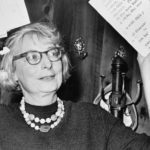 If you have heard of Jane Jacobs then you know she championed walkable, and people-oriented communities. 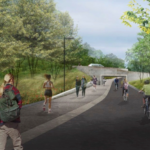 The walks are designed to encourage people to tell stories about their communities, explore cities, and connect with neighbors. And as special treat, we had Jane’s great niece, Amy, join us on walks in Beacon Hill and Ballard! The praise for our walks doesn’t get much better than that. Join a Feet First Walk. We have at least one FREE walk a week, and often times a whole lot more. Take a look here. Are you a people person that loves to inspire wonder and pride in your community? Then consider becoming a Neighborhood Walking Ambassador. 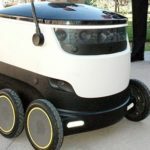 Through this fun, healthy and educational program you connect people through walking. Allowing them to discover the gems and joys of their communities that you can only appreciate on foot. 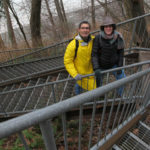 Take a look at an upcoming Neighborhood Walking Ambassador training and start walking to connect. Contact Jules Feibelmann at 206.652.2310 ext. 5 to register or to learn more about the training.